AS FULFILLING AS IT IS TO BE A SPORTSMAN, IT'S EVEN BETTER TO HUNT WITH ONE. The latest addition to the Remington® Model 11-87™ lineup, our synthetic Sportsman® series is quite possibly the best autoloader value on the market. These shotguns are ultra-reliable, rugged, fast and available in a wide range of popular 11-87 models. Even those on a tight hunting budget can now obtain legendary Remington autoloader performance. 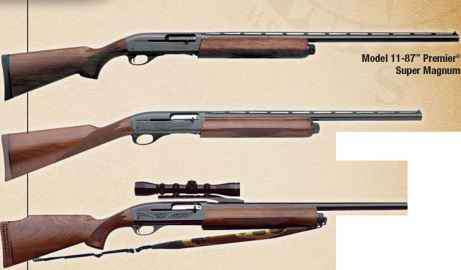 Touted as the value-priced workhorses of Remington shotguns, Sportsman offerings include 12- and 20-gauge field versions, 12- and new 20-gauge fully rifled slug guns with cantilever barrels, and a 20-gauge youth model with 2 3/4" and 3" capability. Our new NRA®-edition 12-gauge stays hidden in the woods with a Mossy Oak® New Break-Up™ stock and fore-end, and stands out from the lineup with an NRA Heritage logo on the receiver. The Model 11-87™ Sportsman® provides the soft recoil and superior handling that made the Model 11-87 famous. It's constructed with a solid-steel receiver and a super-smooth action for quick follow-up shots. Now the term "sportsmanship" can apply to how you hunt and the dependable, slick-shooting companion you're hunting with.